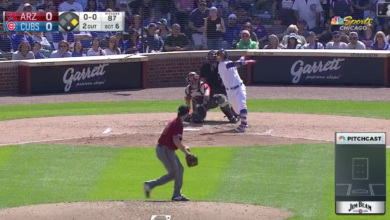 Even though Kris Bryant hadn’t hit a home run in 58 plate appearances since coming back from an extended stay on the DL, he’d been showing some pop to the opposite field. That’s something we had predicted would be the case back in late August when he started showing off a new swing with a two-handed follow-through. Of course, we can’t hold a candle to Cubs color man Jim Deshaies, who straight-up called the shot at the start of Bryant’s at-bat. And then Len Kasper called the shot at the end of Bryant’s at-bat. To be fair, the swing he’s using now is not what he displayed in those early BP sessions. But the stroke is a little more compact and the finish not nearly as long, so a lot of the same concepts are in play. Bryant’s pinch-hit single Sunday afternoon went to right at 102 mph and his base knock earlier in Monday’s game was also to right and left his bat at 105 mph. Then came the big one.